I’m so on point this year. Getting all prepared for the holiday season already! Crossing my list and getting all my Christmas crafts done early. 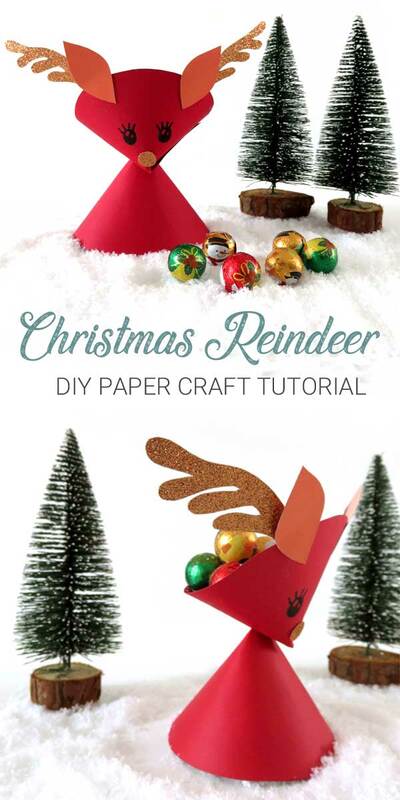 Gives me plenty of time to write out a tutorial for you, giving you still enough time to make these paper Christmas reindeer yourself! In time for the holidays! 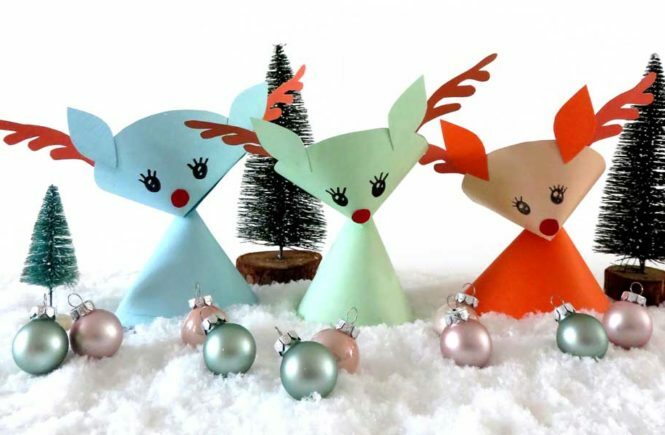 And the best thing is, these paper reindeer double as party favor candy holders! You can place a small surprise treat in between his antlers. Does it get any better? Want to save for later? Pin it! 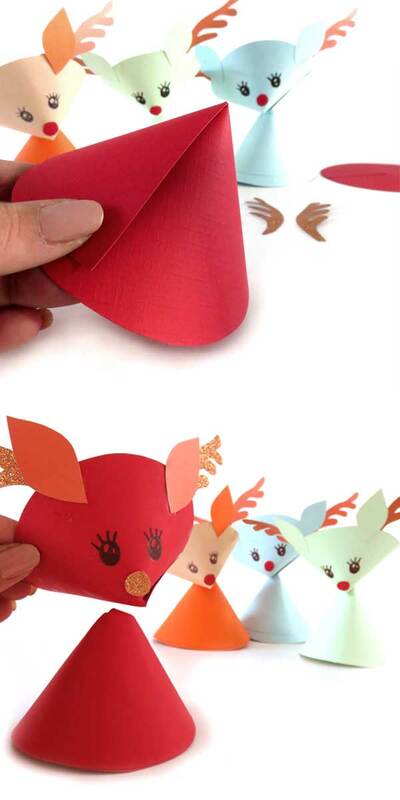 These reindeer are super easy to make, you can even get the kids involved. My five year old made some very interesting multi colored ones choosing from the card stock paper pack as he pleased. I helped him with some of the cutting of the pieces, but he was a glueing master. 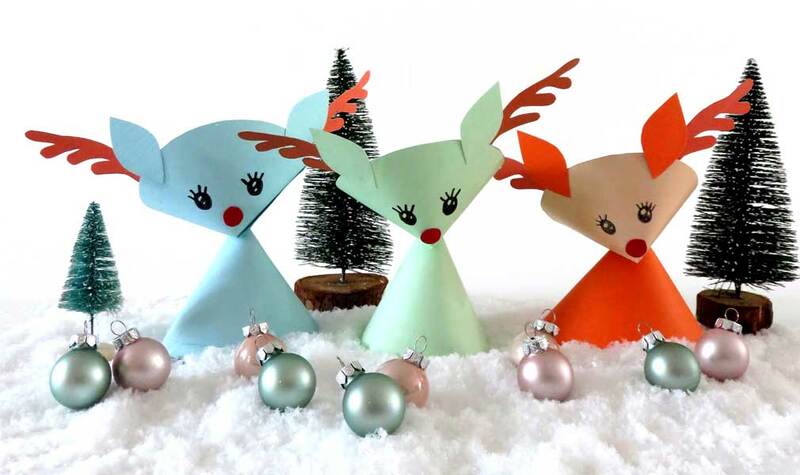 The reindeer are made of two paper cones and a few cut out pieces as shown below. 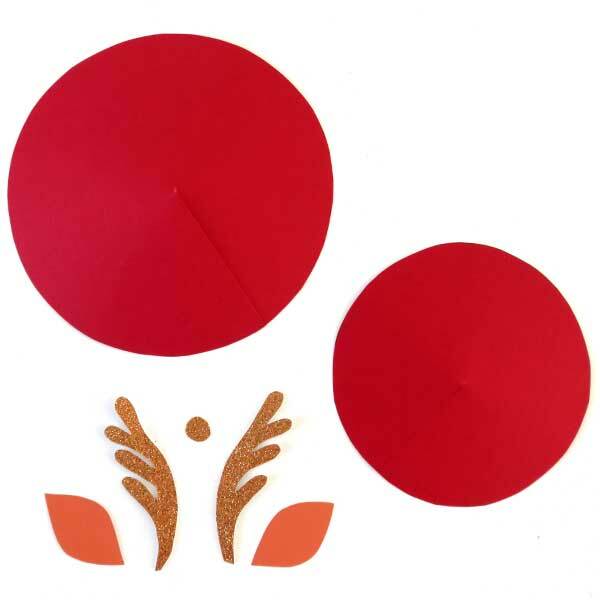 For the head draw a circle with a 4.5 inch diameter, about the size of a DVD. Make one cut to the center of the circle, lap the ends to form a cone and glue. If needed, you can use a clothespin to hold it together while it dries. Cut two antlers, two ears and a small round nose as the pattern shapes show. Glue the antlers to the inside of the head cone, and glue the ears on the outside right next to them. Glue on the nose. Take your marker and draw the eyes on the head. The body cone is made from a 6 inch diameter circle. Cut into the center, lap round to shape and glue. Fold the top of the body cone over, just the 0.5″ tip or so. Glue the head cone slightly slanted on top of the folded over tip. 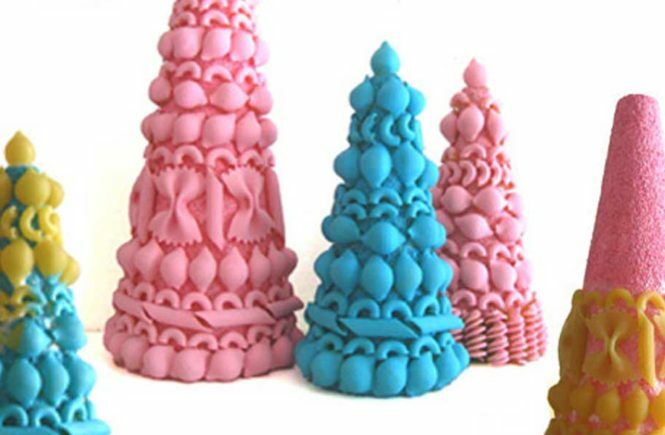 Fill head cones with the treats. 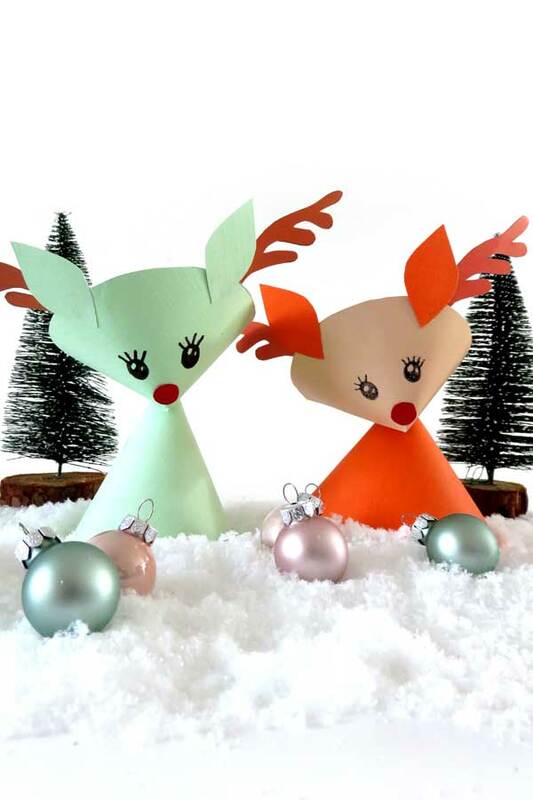 These paper Christmas reindeer are a cute addition to your holiday decor. 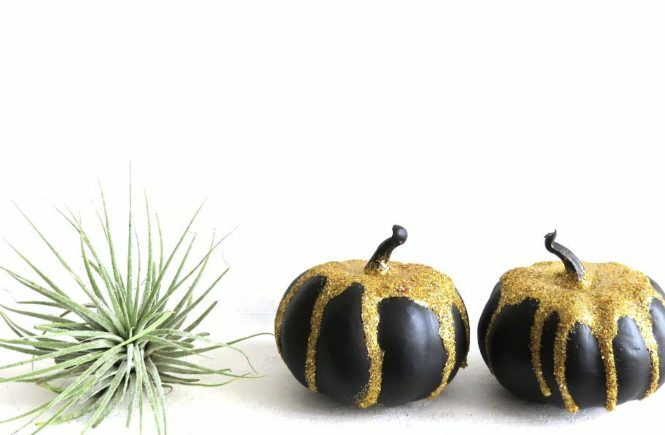 Choose colors to fit the rest of your decorations. 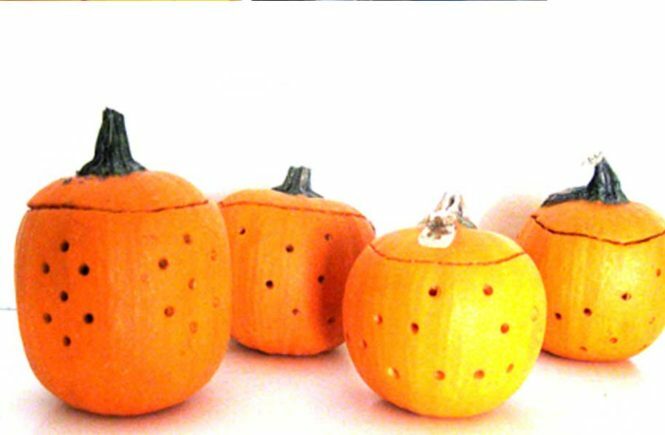 When filled with small treats, these are perfect to place next to the plates on the Christmas dinner table setting. Let the kids help making the reindeer for the kids table. 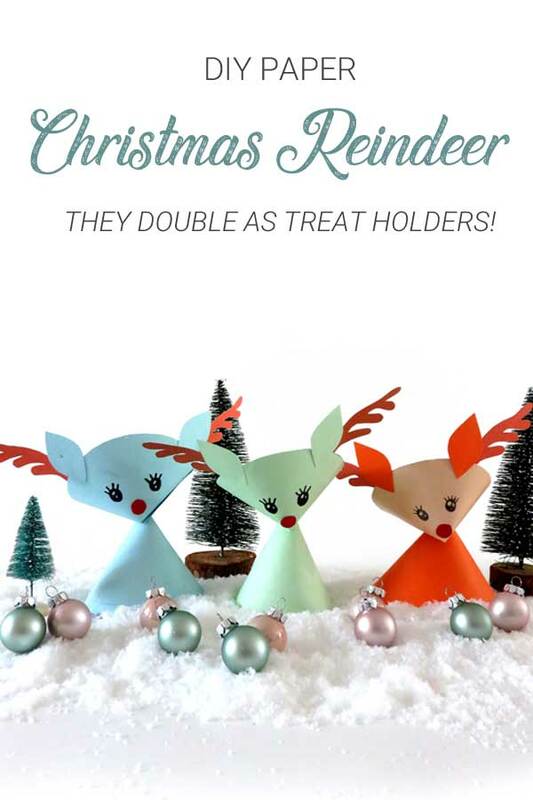 Tag me @modandmint on your favorite social media when you make these reindeer, i would love to see!